On December 1st the university held its annual Vice-Chancellor’s Volunteer Achievement Awards Ceremony, which recognises the amazing contribution made by over 2600 volunteers. 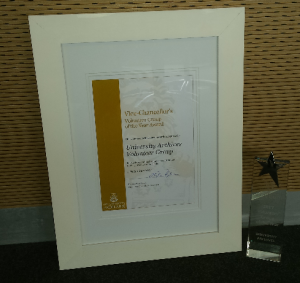 This year the University Archives Volunteers group are the very proud co-recipients of the Group of the Year award! Congratulations to all of our volunteers, and thank you so much for your hard work throughout the year. This entry was posted in Events, University Archives and tagged Volunteer News. Bookmark the permalink.